Rice has long been Thailand’s traditional food crop and the country’s main export product. Though declining in relative importance, it still occupies about 55% of the total arable land . Over 80% of the Thai population eats rice as their main meal, with annual per capita consumption totalling 100.8 kg. The world too, depends on the country’s rice. Despite recent uncertainties, Thailand remains the world’s largest rice exporter according to the UN Food and Agriculture Organization’s Rice Market Monitor. The country’s rice exports in 2010 are forecast to exceed 9 million tonnes. Nonetheless, Thailand suffered more than $1.75 billion in economic losses related to floods, storms, and droughts from 1989-2002, says an Asian Development Bank report (PDF) entitled The Economics of Climate Change in South East Asia. The main share of that ($1.25 billion) was from crop yield losses. The unpredictability of conditions that affect rice growing — such as rainfall distribution, temperature levels and increasing types and occurrences of pests and diseases — will intensify in the years ahead due to climate change. This means Thailand will see drier spells in the middle of the wet season which can damage young plants, and floods at the end of wet season that affect harvesting. Adaptation to climate change is therefore very important for development of rice production in Thailand. Even though the government of Thailand has begun work on an action plan for global warming mitigation and is providing information to raise awareness about climate change, many rice growers have inadequate knowledge for the efficient management of their farms under the impacts of a transformed climate. Traditionally, farmers grew rice for household consumption by using seeds and seedlings from the previous crop, which were mostly resistant to pests and disease. As part of the plan, the Thai government has been promoting new genetically modified (GM) varieties of deep water rice (not re-usable), which usually remain in flood waters of over 50 cm for one month. New drought-resistant rice varieties — RD12 for glutinous and RD33 for non-glutinous rice — are also being produced with the application of DNA technology and distributed to drought affected areas. However, since the government cannot provide enough of its own to distribute to all farmers, many private companies are also producing these new varieties. As a result, the farmers that can afford to buy them have shown an interest in new varieties of rice that will provide higher yields than traditional varieties. For those that cannot afford the new seeds, the most commonly used adaptation techniques have been to change cropping patterns and the cropping calendar, and improve farm management. The government has also constructed embankments to protect rice farms from flood damage. Risk transfer mechanisms should also be included in adaptation strategies from the national to the household level. This can include crop insurance or more diversified livelihoods, such as integrated aquaculture-agriculture systems that allow farmers to shift in response to changes in the suitability of land and availability of water to produce food. In the short-term, integrated farming provides various types of crop yield improvements, while in the longer-term the benefit is the increased sustainability of farming systems. There already exist good examples of local people experimenting with such adaptation methods, according to case studies from a report entitled Vulnerability Assessment of Climate Risks in the Lower Songkhram River Basin of Thailand. For example, in Na Dok Mai, villagers estimate that around 10% of residents lose their entire crop during particularly severe floods. However, a majority of 80% have rice paddies both in the floodplain and at higher ground. Therefore, even if the rice in the floodplain may be damaged, families are able to rely on their higher ground crops for their household consumption. Adaptation to climate change is already taking place in the cultivated areas of north-eastern Khon Kaen Province where the total planted area of rice was approximately 404,432 hectares or nearly 64% of total crop areas in 2007. Here, most small farmers face extreme drought in the middle of the dry season and floods in the early part of the wet season. At the same time, rice prices have fluctuated in recent years as a result of global uncertainty and therefore there have been limited opportunities for farmers to increase their incomes. For our research in Khon Kaen, we conducted both modeling and a survey of a total of 300 small-scale farmers from February to March 2010 in 11 districts. The surveyed districts were selected based on agro-climatic zones in order to capture the climatic variability across the province. Our modeling found that in the case of an increasing temperature trend of 0.1-0.3 degrees Celsius per decade, fluctuating rainfall and evaporation is estimated to account for over a 10% decrease in rice yields across the province due to flooding and drought, and increased pest outbreaks. However, we also estimate that rice yields per area in 2047 can be larger than in 2027 due to the use of more efficient techniques. Our survey revealed that farmers in this area are aware of climate change because they have been farming there for many generations. Many farmers have changed to complement their production of rice with mono-crop cassava and/or sugarcane, in order to cope better with fluctuations in the price of rice. In fact, over 70% of the farms in the villages studied, averaging just 2.5 ha in area, were integrated farms. Although we found that the majority of farm income still comes from rice yields, farmers were able to create sufficient income through a combination of other crops including tilapia fish, cucumber, long beans, spring onions, etc. In addition, all kinds of plant residues, such as rice straw and vegetables, are more commonly being utilized as materials for compost, along with animal waste from cattle, pigs and chickens. Farmers have started to make investments in their ponds and crops in the dry season and benefit from pond fish as a new source of both protein and income. Diversifying the life-cycle can ultimately minimise financial risks and help preserve biodiversity. Still, the inability to predict seasonal shifts, or to adapt their activities to new climate conditions, often negatively affects villagers’ livelihoods. Water shortages have meant that some rice farmers, mostly those from the 20% able to afford newer more adaptable seed varieties, are following shorter planting seasons. At present, only 10% of the farmers are receiving government seed, meaning that the remaining 70% or so are still saving seed from the previous year. Overall, adaptation measures to diminish the risk of damage from future climate change and from present climate variability will require financial and technical assistance from both the Thai government and international donors to cover the additional costs of designing and implementing interventions. It is true that climate change can have positive impacts on rice yields, if farmers adapt their rice growing techniques by changing the planting date and using appropriate rice varieties. However, importers in the world market are also starting to require rice from more environmental friendly farming systems including traditional organic methods. Rice crops in Thailand alone required nearly 0.3 million tonnes of nitrogen fertilizer in 2007. In addition, the planting of rice paddies increases the release of methane, a major greenhouse gas. 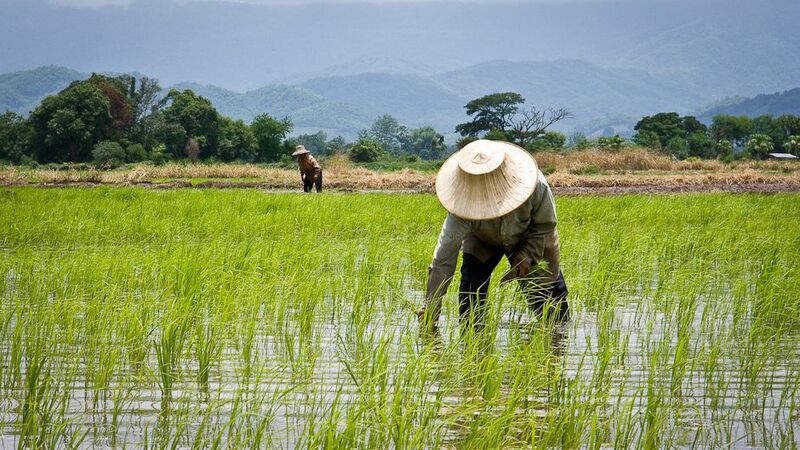 In fact, of the 91.6 million tonnes of methane emitted by Thailand, half was due to rice cultivation. It is clear that the government should place an emphasis on production processes that not only increase yields, but are environmentally friendly and raise awareness about climate change in the Thai population. Thailand’s Rice Farmers Adapt To Climate Change by Jintana Kawasaki is licensed under a Creative Commons Attribution-NonCommercial-ShareAlike 3.0 Unported License. Dr. Jintana Kawasaki was educated in Thailand and Japan. She holds a Ph.D. in International Bio-Business from Tokyo University of Agriculture, during which she studied the sustainability of organic vegetable farming in comparison with other production systems in Thailand. She also holds a M.Sc in Agricultural Economics in the School of Economics from Kasetsart University (Bangkok, Thailand). Before joining the United Nations University Institute for Sustainabiltiy and Peace (UNU-ISP) in 2009, she was a lecturer at Kasetsart University and Khon Kaen University’s Department of Agriculturalk Economics. At UNU-ISP she has focused her research on the impact of climate change on rice yields, and an economic assessment of its impacts in Thailand. This is a very good research summary. In the Noratheast, farmers have faced problems of erratic rainfall for years. They realize the increasing environmental risk and should be the first group to adapt to climate change. Here, adaptation should be different by ecological zones; flood plain, undulating terrain and the upland areas in the Northeast. Your article is very interesting and informative. I agree with you that we need to adapt to the change. I belive we should continue to monitor the impact of climate change and evaluate how the public and private sectors, as well as NGOs and service agencies, handle the chllenges that confront not only the rice farmers but all stakeholders in the agricultural sector. Please tell us more Elisimtowe. Either here in a comment or via the Contact Us page. Thanks! It is very good study. Where can I find a full report? Is it available anywhere in Khon Kaen?